Lovienthal Montague Spiritual Detective can only be described as a raunchy, dark-humored zombie thriller that breaks from the mold of traditional zombie books which typically feature a fearless lead character who always knows what to do, what to say, and how to handle every situation that may arise in the most tactful way possible. Lovienthal Montague is overweight, balding, and has zero life skills. At age 50, he finds himself an unemployed, lifelong welfare recipient as well as a recreational drug user living in a rundown mobile home in Ocean View Trailer Park. Often harassed and mocked by the neighborhood children, and loathed by society’s adults, Lovienthal on any other Friday morning would find himself with no good reason to even get out of bed (and thereby usually electing to sleep in and nurse his hangover), but this Friday is like no other, because today’s the day Lovienthal stops working for the man and starts working for himself. He has decided to become an entrepreneur and start up the Lovienthal Montague Spiritual Detective Agency which its mission statement is to teach people long caught up in society’s rat race how to become righteous again--only Lovienthal’s first day on the job doesn’t go exactly as planned. After spending the afternoon putting up fliers and passing out business cards, Lovienthal and his friends (a very motley crew of society's rejects) find themselves suddenly thrown into a world were the dead would rather walk the streets and have him and his friends for dinner rather than just stay dead. Lovienthal along with his trusty dog Chuckles, several friends (including his drug dealer), a few rednecks, and a couple of Laotian boys find that they are forced to put aside their petty differences and mistrust of each other and will have to work together if they’re ever going to make it out of the apocalypse alive. In a world that makes each of them feel like they’re utterly alone, worthless, and a born loser, Lovienthal and his friends, only through coming together as a team and caring for one another instead of just themselves, find that they’re each unique, courageous, and have self-worth, even if society doesn’t always see them that way. And, only united as a family, do they find lies their best chance at survival. 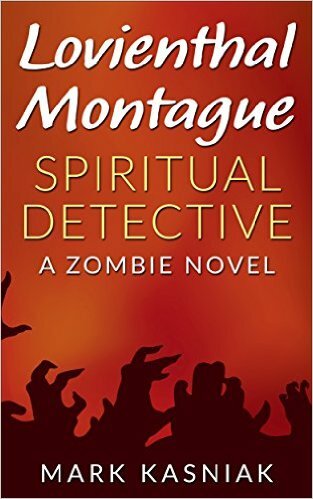 Lovienthal Montague Spiritual Detective also has alternating chapters which follow an Air Force commander’s investigation into the zombie outbreak.